I'm back! 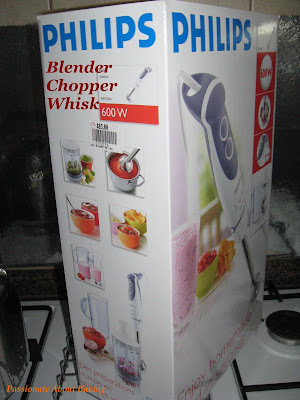 I was just thinking to get this kind of blender today for my creamy soup recipe. I realize there is another brand named "Braun". What do you think? Welcome back to Singapore! Heehee...What a coincident too! Braun is only 450W and is the same price as Philips in Best Denki. According to the sales person in Mustafa, Philips is 600W which is faster. I used the "turbo" function and is really fast! Gets its job done within seconds! Philips has another model which is not stainless steel and cost $10 lesser than mine. Have you looked around anywhere? I bought the same model of blender as you yesterday. I think you're right! Philips has the bigger watt than Braun and the other two accessories also bigger than Braun. Thanks!